There are few holidays as desperately in need of cinematic adaptation quite like Dia de Los Muertos (Day of the Dead). The idea of it may sound macabre, but to see the imagery displayed every November 1 would suggest that it is a joyous occasion. With colorful sugar skulls and vibrant music, it deposits the idea that death isn't the end of someone's life. It lives on in the memory of the living, which is celebrated with colorful tapestries. Pixar's latest Coco is a film that fully realizes what makes this holiday so special not by detailing every custom, but by embodying the mood and themes of the holiday. It's a family film that ironically is full of life even as 90% of the cast is seen in the land of the dead. With beautiful animation that pays attention to details no matter how small (the on screen depiction of instrumentation has never been better for an animated movie), this film serves as a great introduction to secular audiences about not what Dia de Los Muertos is, but why it is celebrated. On its surface, the plot of Coco reads like a Mexican Footloose. Young guitarist Miguel is forbidden to play guitar because it brings shame to his family. But why must something so joyous be seen as a crime, especially as his idol Ernesto de la Cruz is seen in vintage performance clips surrounded by swooning fans? It's the heart of the story, and one that develops into an odd and twisted tale that leaves ambitious revelations for the third act. In the meantime, Miguel only has stories to understand his family's past. It's a story that has been fabricated over generations, even displayed in decorations that hang over the pueblos in town. The story has become compromised in a way that society can agreed upon. It's why Ernesto de la Cruz is seen as a hero, and "Miguel's father" is a public shame. Miguel is a compelling protagonist eager to find answers, even by accident. Everyone in the land of the dead may be deceased, but their lives live on over decorated graves where living family members honor their legacy. The wayward Hector is an exception, whose choice to disguise as Frida Kahlo still doesn't get him in. Nobody remembers him, and thus he can't exist among a society whose pictures are plastered over tributes with candles burning brightly. He is met as a scammer, and someone who brings the film its initial comedy as he dismantles his entire body to slide through tight corners. Despite his outsider status, he is the voice of reason; the insider to this land. His ragged appearance contradicts those of the generally middle to upper class appearance of the other residence, whose colors have a gleam to them. There is no character lacking flair in this story, and it only adds to the beauty of the Mexican tradition. The land of the dead is another masterstroke from Pixar. The multi-layered sets reveal cities that make New York City's Big Apple look dim. The buildings almost seem to float above the skyline with streets weaving below in a majestic maze. Much like Mexico itself, it is a bright and joyous landscape that captures the imagination, forcing the audience to be in awe of what they see. The terminology and traditions may be foreign, but Pixar manages to make it all accessible thanks to how much love for life is on display throughout the film. Even the rich tapestry of music found in numbers like "El Poco Loco" and "Remember Me" add to the atmosphere, making one not only think fondly of their loved ones, but become envious of the parties that the living are missing out on. With enthusiastic cries, the music solidifies the movie as an expression of life and memory. This is also true of the story, of which balances comedy with darkness in surprisingly effective ways. Pixar isn't afraid to tackle death in movies (Toy Story 3, Inside Out), but this may be the first time that they explored something richer than someone's absence. Here, death is central to the entire story, but it holds many facets. Death symbolizes the stories we tell to keep memories alive; of how we keep them relevant to the living; and what happens when this ceases to exist. By some miracle, the film manages to avoid pure bleakness and instead perfectly balances its bittersweet elements with joy. Death isn't a taboo, but another part of someone's story. It is important to be truthful to what they stood for. In a nutshell, this is what Dia de Los Muertos stands for, and it's what Pixar gets right more than any guitar playing or bright fluttering dress. Coco is a film that not only understands its subject, but invents a reason to care. While there have been other films about Dia de Los Muertos, none have been this engaging and breathtaking. Each frame packs a visual wonderment that makes the viewer want to learn more about the holiday. It thankfully avoids the error of being a faithful adaptation of the holiday's customs, instead choosing to focus on the themes. With a compelling protagonist in Miguel, the story effectively mixes slapstick and heart with music and colors that pop. It may be a bit sloppier than the best that the studio has given, but it's still bound to be a new holiday tradition for those families wanting to remember why it's important to remember. 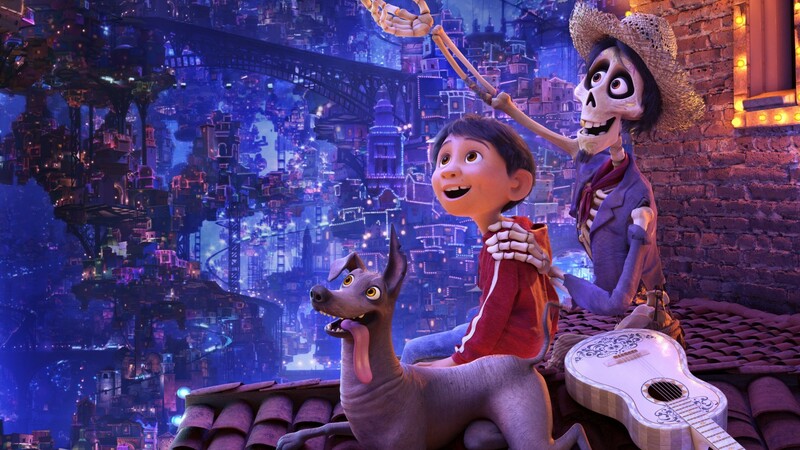 With catchy music and better visuals, Coco is a special film that will hopefully continue to inspire and set a new precedent for how this beloved Mexican holiday is depicted on screen.